Monday Night Raw #1055: August 12, 2013!!! YO! YO! Put your f**k!n fingaz up, muthaf***az! Coz if you don’t give a f**k like we don’t give a f**k PUT YOUR MUTHAF**K!N FINGAZ IN THE AIR!!! This is how it goes down! Once friends now enemies fighting over a leather briefcase! NXT Sistrins now NXT Nemesis team up with their respective men to go at it tag team style! Someone is gonna get BURNT! Can David bring down Goliath? Will the IWC go YES! YES! YES! or NO! NO! NO! and make angry YouTube videos forgetting to wash themself first? It’s the RAW before SUMMERSLAM!!!! #1055! HOLD DAT – BLAOW!!!! Before I go in, I just wanna say that Total divas on E! is THE MOVE! Ssssssssshhhh! Don’t tell the wrestling purists! They will get mad if you watched Total Divas over G1 CLIMAX this past weekend! F**K THAT – IT’S ABOUT A WOMAN’S WORTH! I don’t watch wrestling 24-7 jabroni!!! I should have known that if Brad Maddox is the referee, something was gonna go down with the Wack Barrett Vs Danielson match…. Danielson missed the YES Kick, Barrett rolls up the kid, and the scrawny Maddox used a fast count!!!! TEEEEEEEEEEEEEEEEEF! Look at the sissy Maddox reminding Danielson that he can shut down the main event if Danielson does something rash… I would have f**ked him up same way, because I know Triple would rectify the situation right! GM or no GM, Danielson you should have kicked him down! You think Austin would have thought twice? it would be an instant STUNNER!!! I wanna big up Cody Rhodes… you know why? He threw that stupid fisher price My First Briefcase in the drink a few weeks ago, and now Sandow get himself a nice sensible leather briefcase! Very good Cody! I still hope Sandow f**ks you up at Summerslam! Don’t expect much praise from me! Interesting… Cody Rhodes claims that Sandow WILL NOT become the World Heavyweight Champion before he does…. WELL THE GRANT SAYS you might be right… but the moment you’re champion and you just had a gruelling match, who do you think would cash in his cheque against you??? You wanna think about that! Why is there all this talk about Sandow & Randall cashing their cheque at Summerslam? I can sorta understand in the case of Randall… but let me tell you NOW: They are NOT gonna cash in!!! It’s what everyone expects! F**K THAT! Come check me next week and know that I’m right! Big ups to Dean Ambrose!!! He just said that if the ghost of André The Giant is not in the Battle Royal then NO ONE CAN BEAT HIM for the US Title!!! Now the rest of the Summerslam card is getting put together! Wack theme song that WWE has chosen…. some bullsh!t @$$ tune by 2Chainz? We don’t do that over here THIS IS THE STC! Cage Amateurs UK! THIS IS HIP HOP! (Just check the tune above, top of the blog! Big ups to Big E Langston! He said what I’ve said all along…Ziggler needed him to win his matches… Langston didn’t need Ziggler at all! YES! That’s the SISSY you support! Some of you have sons, and you are telling your sons that a wrestler wearing pink brief and whines himself and ‘twerks it’ is OK????? WAKE THE F**K UP MUTHAF***AZ!!! SHOCK! HORROR!!!! Natalya defeated AJ! No need to go to specsavers – YOU SAW RIGHT!!! Natalya won a match!!! Natalya for women’s champion STRAIGHT AWAY!!! UH OH!!! Somebody’s in trouble…trrrrouble… TRRROUBLE!!! Brad Maddox must answer to Vincent Kennedy!!! He could be fired right now!!! Now he wants to be the ref for Cena Vs Danielson at Summerslam????? TEEEEEEEEEEEEEEEEF!!!! …and just as Vincent Kennedy was about to appoint the Sissy Maddox guest referee, Triple puts a stop to that ONE TIME! Now Triple Teef is the guest referee!!!! Right you unwashed IWC idiots, I hear you saying ‘Overkill’ on the main event, why don’t you shut the f**k up for a minute… Triple claims he’s got everything on lock, I’m not so sure! Last time I check, Triple was the ref for the John Cena Vs CM Punk match two years ago, and what happened? Kevin Nash f**ked it up for CM Punk!!! Just reminding you… IT’S WHAT I DO!!! That’s it Kane! Out-think the Wyatt massive! I see you rude boy! Using an Undertaker mind game! Disappear out the ring and appear at the other side!!! Drop the FYRE on em!!! the fire is the purification!!! But yo! Bray Wyatt is loving everything!!! This Ring of Fire/Inferno match is gonna be MAAAAAAAAD!!!! You know what’s even better at Summerslam? 2 Divas matches!!!! Brie Bella and Natalya catch up!!! Natalya gave the b!tch slap last week – Brie turns the other cheek! She’s only doing what was written in the good book! Brie is bringing her girls – Nikki and that troublesome red-head Eva Marie, Natalya bringing my favourite Nubians – Cameron & Naomi! YEAAAH BOYEEEEE! You jabronies hit the bathroom at that time – give me a bucket of fried chicken and a supermalt and I’ll enjoy this sh!t!!! Yeah! I’m not a pro wrestling fan so what!!!! At least not any more!!! Hold up – did Zeb just wish death on 2.5 so called ethnic minorities??? If you still a Coulter fan I am liable to punch you in your f**k!n mouth. Ok Usos – don’t let these bigots beat you this time! If they beat you, you have disgraced Rikishi, Haku, Superfly Snuka, Umaga, Tamina, Roman Reigns, The Rock, and most importantly, High Chief Peter Maivia!!!! YES! YES! YES! YES! I’m feeling like Danielson right now!!! GWARN USOS!!! The stars and legends are proud!!!! IT’S ALL ABOUT THIS SAMOAN FIST!!!! Now for some serious sh!t…. The Miz got Cena and Danielson on his show, and was told by Danielson to stop his noise before he boxes him in his mouth! Cena spouts the same sh!t, it is real talk what he says though, he deals with critics every day, he knows he hears them (and by that, he means you IWC) go on about his 5 moves of doom and his make a wish stories… but Danielson says he’s in this sh!t for the WRESTLING!! That Cena is a parody of this wrestling sh!t!!! Which weighs out more? Hold up Cena used the dreaded W word – WRESTLING! BACKSIDE!!!! Yo I gotta song for the both of you, but before I do, Cena goes on like he’s beaten everybody…. NEWSFLASH!!! You haven’t beaten Undertaker rude boy! Now for the tune…. It’s a shame, people in the rap game, only in it for the fame extra-large!!!! Cena is not a WRESTLER? The respect isn’t there? Triple comes out to maintain order? Randall reminds em what he got in his hand? SH!T JUST GOT REAL! Now let’s have some fun… what the f**k has R-Truth done to his hair???? Has he relaxed his hair or something? Don’t you love that when Fandango gets buss arse, he still can breathe enough to say what his name is? Why does Summer Rae continue to hang around with this sissy? Ok Battle Royal jump off!!!! The winner, gets to fight Dean Ambrose for the US Title…. in YouTube!!!! Is it worth the hassle? I could back certain guys here but it’s for the US title, I mean big up to Ambrose for putting prestige on it, but it’s like, you dep pon YouTube! Big up Kofi for using crazy skillz and agility to hold out in the Battle Royal! But those racist bastards had to eliminate him didn’t they? BACKSIDE! Well at least Usain Bolt and Shelly-Ann Fraser Pryce represented in the championships lately! Trust in my hero Mark Henry to eliminate the racist bastards! THAT’S WHAT HE DO!!! RESPECT! Big ups to RVD for taking Mark Henry out to face Dean Ambrose! It’s a shame we won’t see them fight at the gathering unless someone hooks up YouTube on their iPh- “WELLLLLLL, IT’S THE BIG SHOW!! !” BACKSIDE!!! Just when the Shield was gonna move in on Mark Henry and RVD, Mr Iron Clad contract appears ready to bring the ruckus! Did you see the look on Seth Rollins face??? He was like – OH SH!T!!!! Now I get it!!! RVD fights Ambrose, Mark Henry & Big Show combine their force against the tag team champions. As for the Ryback….sh!t just hasn’t been the same since John Cena called the Ambulance on his @$$!!! Ok here’s the main event! Yo what happened to Heyman’s ECW music???? Sound bwoy! DJ! Fix up man! IT’S A TRAP!!! Screamed the IWC and the WWE Universe! Well no sh!t Sherlock!!! Now according to Heyman, it’s up to Punk to play the ‘stupid hero’ and get buss arse, or not turn up at all and be a ‘smart coward’. Thankfully for Punk, he was neither… Wolverine knows about stealth techniques!!!! Disguised as a camera man, took the camera, beat it over Brock’s head with it – BLAOW!!!!! Grabbed a chair, took advantage of the fallen beast – slam it in his back bone – BLAOW!!! Heyman’s legs did run!!! And again, not one scratch pon him face!!!! It’s just like Paul Bearer back in the day – he always got away from getting buss arse by Undertaker after the betrayal and once Undertaker got his hands on Bearer – his goose cook! And soon that will happen to Heyman! DROP THE BOMB ON EM!!!!!! 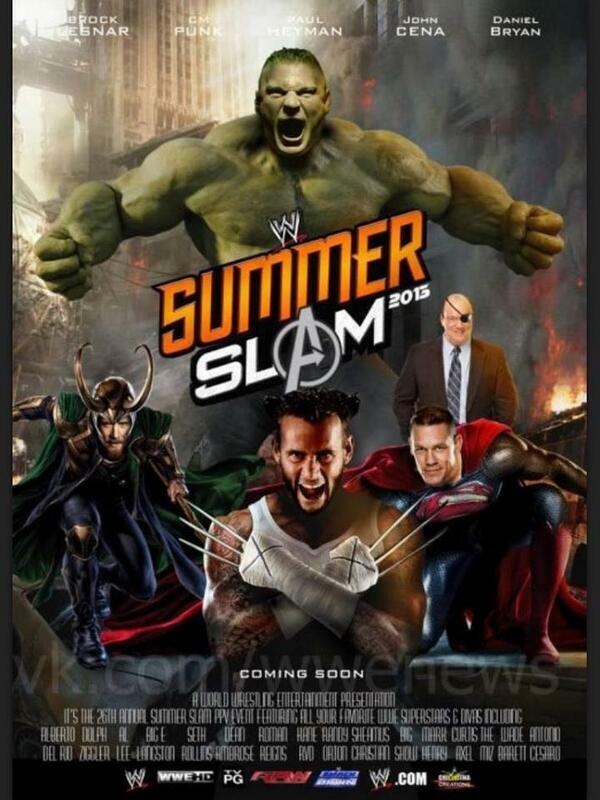 ARE YOU READY FOR SUMMERSLAM NOW??? THE BATTLEGROUND IS SET!!! BRING THE MUTHAF**K!N RUCKUS! IF YOU DON’T GIVE A F**K LIKE WE DON’T GIVE A F**K PUT YOUR MUTHAF***!N FINGAZ IN THE AIR!!! This entry was posted in The Infamous Informer and tagged CM Punk, Jerry Lawler, Summer Rae, Summer Slam, The Infamous Informer, The Rock, The Undertaker, World Heavyweight Champion, Wrestling, WWE on August 13, 2013 by Jon P.